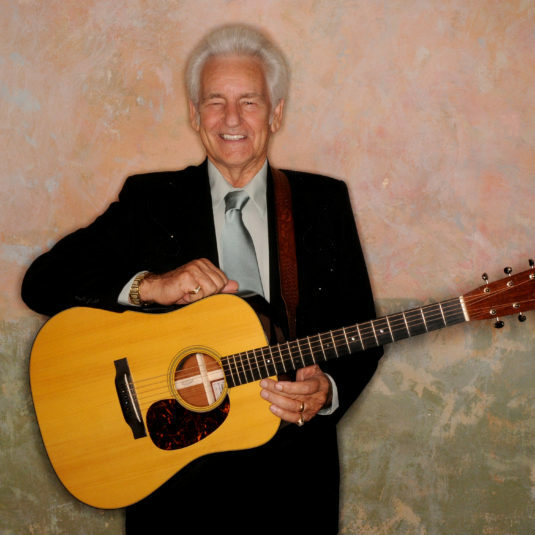 Even among the pantheon of music’s finest artists, Del McCoury stands alone. From the nascent sound of bluegrass that charmed hardscrabble hillbilly honkytonks, rural schoolhouse stages, and the crowning glory of the Grand Ole Opry to the present-day culture-buzz of viral videos and digital streams, Del is the living link. On primetime and late-night television talk shows, there is Del. From headlining sold-out concerts to music festivals of all genres, including one carrying his namesake, there is Del. Where audiences number in the tens of thousands, and admirers as diverse as country-rock icon Steve Earle and jamband royalty Phish count as two among hundreds, there is Del. Emerging from humble beginnings in York County, PA nearly eighty years ago, Del was not the likeliest of candidates for legendary status. As a teen, he was captivated by the banjo playing of one of its masters, Earl Scruggs, and decided he’d be a banjo picker, too. The Baltimore/Washington, D.C. bar scene of the early 1960s was lively and rough. Del caught a break. More than a break, really. It was an opportunity of a lifetime; joining Bill Monroe’s Blue Grass Boys in early 1963. Considered the Father of Bluegrass, Monroe transformed McCoury, moving him from the banjo to guitar, anointing him lead singer, and providing him with a priceless trove of bluegrass tutelage direct from the source. Countless hours of recording sessions and miles of tireless touring dotted the decades. Del carried on, and carried with him the hallowed traditions of the form and its dedicated following. The passing years became certificates of authenticity. So, in the sea of grunge and R&B that dominated the music scene of the mid-1990s, it was special, perhaps even startling, to see: There was Del. Now helming the Del McCoury Band, with sons Ronnie and Rob, the ensemble did and continues to represent in a larger, growing musical community a peerless torchbearer for the entire sweep and scope of bluegrass history. Those many years, not to mention a good-natured willingness to stay alert to the latest sounds and opportunities around him, earned McCoury a whole new generation of fans, including in some unlikely places.